Sage advice, but largely meaningless. Covers sell books. A friend of a friend who writes romance eBooks advised me, if I ever published that way, to make sure that the cover looked like all the other covers for the same kind of book. She wasn’t talking about how good the cover looked. She was talking about branding. Did the cover scream at the top of its voice Romance, or Science Fiction, or Zombie Book. I understood exactly what she meant, from sad experience. 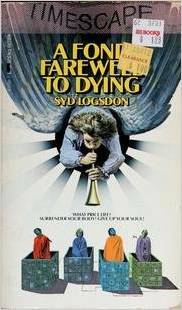 The cover for A Fond Farewell to Dying has an angel with a trumpet calling what appear to be dead folks out of some boxes. It fit the story only by a massive stretch of imagination, but it did look like one of those End of the World books that used to be popular. I found it once on a spinner rack of Christian books. Somebody got a surprise when they got home that night. At least it used to be that you could pick up a paperback and read the blurb, but that is usually wildly inaccurate. The only hope you had, in the days when people went to bookstores and actually handled the books they were about to buy, was to read. Usually, the first few pages would tell you if you wanted to continue. That is why every how-to-write book you’ve ever read stresses making the first page great. That also works for selling manuscripts. If the first page is terrible, no reader or editor will ever read page two. Of course, there are fifty other hoops to jump through between a good first page and a sale. At least a good first page might sell a book once it’s published and on the newsstand. The reader won’t come to hate you until he has slid into bed, with the light burning, and then finds out that everything goes south after page fourteen. All tucked in and nothing to read; and out a few dollars besides. Grrrrr. So what do you do if you buy on line? You use the Read Me function, of course. Technology giveth and technology taketh away, and the Read Me function is a pure gift. It’s like thumbing through the first pages of a novel by a new author in the newsstand to see if you like him (or her), but without the clerk giving you the stink eye. And you can do it in the comfort of your own home. It’s heaven. It’s amazing how many books I haven’t bought, because of the Read Me function. This entry was posted in A Writing Life and tagged literature, review, science fiction, writing on September 24, 2018 by sydlogsdon. Yeah, Read Me is a big help, but it’s actually my third or fourth step to choosing a book. First comes the cover. In science fiction, anything that shows space ships is automatically rejected. Usually, what I’m looking for in SF has covers that don’t necessarily scream out the genre. Any book with bare chests, or a couple in an obviously romantic moment — automatically out, regardless of the genre. An usual title will always catch my eye, then probably get knocked out of the running by the cover. Description is next. If that doesn’t pass muster, for any of several reasons, I don’t even bother with the sample. So every part of the presentation counts, but maybe not in the way all that good advice suggests. I could argue with every one of those, but if it works for you, more power to you. I’ll be honest, I don’t even use the read me. I see covers first, and if the cover is in the top 10% that gets me to look over the synopsis, then I look at that. I also look at reviews to see if readers who seem of the same mind as me like it. I only look inside if I am really unsure. I know, I am the very sort of reader that I myself hate, one who doesn’t judge the book by its actual contents. But that has made me extra aware of how important covers are. I think a lot of indie authors still don’t get that. Two comments on this and both of them disagree with me. What a hoot. I almost never look at reviews for two reasons: reviewers are always praising books for reasons that would make me hate them and the most important thing to me is whether the writing style sings. Hence, the Read Me function.